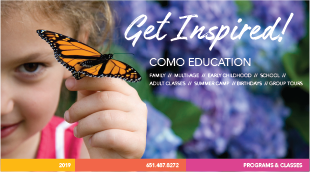 Join us for an educational and entertaining program as we explore the wonders of the Marjorie McNeely Conservatory and Como Zoo. Our classes take you behind-the-scenes or provide an exclusive experience within the zoo and conservatory during non-public hours. From tortoises to monkeys and polar bears to giraffes, about 20 different species of animals are trained at Como Zoo. But how and why do the zookeepers train the animals? Learn the basic principles of operant conditioning training, observe a training session and then meet a trainer for Q and A. There are over 30,000 different species of orchids worldwide. Take a behind-the-scenes tour of the Orchid House in the Marjorie McNeely Conservatory to see our extensive orchid collection. 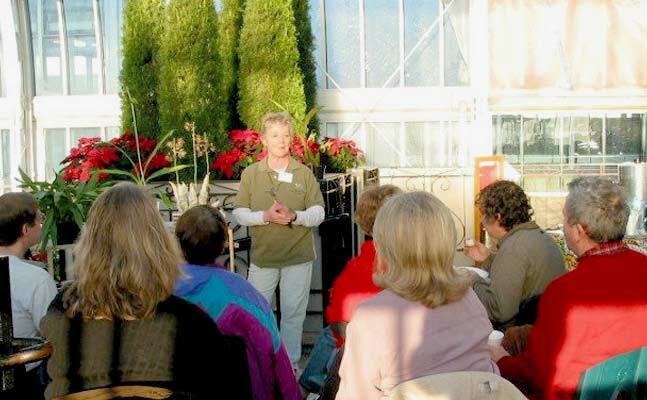 Meet a horticulturist, learn orchid basics, and receive tips to help you grow orchids at home. Nature therapy at its finest! Learn about the fascinating history of Como’s garden as well as the basic design elements of Japanese Gardens around the world. Explore “The Ordway Gardens – A Japanese Collection” before public hours and speak with a horticulturist. Prepare breakfast enrichment for Como’s apes and monkeys. Learn about the individual characteristics that each primate uses to forage, travel, and communicate, then take home some conservation tips to help primates around the world! Create enrichment items for our big cats and observe the fun without the crowds! Learn more about why we provide enrichment, the dangers big cats face in the wild, and the conservation efforts in place to protect these magnificent animals. Unlock a bit of mystery as we tour the greenhouse, gardens, and a zoo exhibit without the crowds. 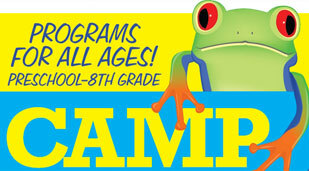 Chat with a zookeeper and gardener as they work to get ready for guests, and meet a few of Como's education animals. You'll discover what makes Como such a magical place!